The BJP promised to ensure a continuous flow for the river. That is undermined by new hydel projects in Uttarakhand. On October 26, the Press Club in New Delhi saw an angry press conference. A group of sadhus from the hill state of Uttarakhand, flanked by activists working to preserve India’s increasingly beleaguered rivers, criticised the Bharatiya Janata Party, accusing it of reneging on its election promise to revive the Ganga. 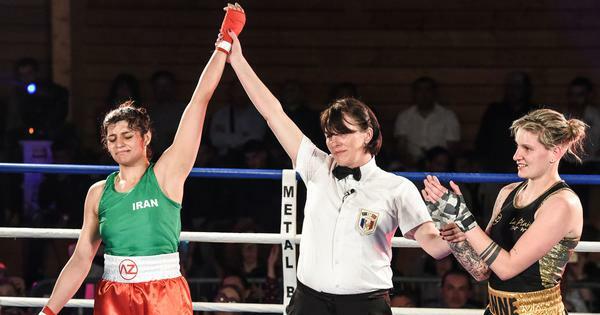 The focus of their anger lay 400 kilometres to the north. Since 2002, Uttarakhand, where the Ganga originates, has been on a drive to build hydel power projects. The state, which currently produces 4,000 MW of hydel power from 98-odd projects, has since 2009 signed agreements to build another 350 dams. Most of these are diversion dams, which block the river and divert its water through tunnels to turbines that generate electricity. The river rejoins its original course only after passing over the turbines, leaving riverbeds dry between the dam wall and the tunnel’s outlet. For instance, the Bhagirathi, one of the sources of the Ganga, runs through tunnels for half its 220-km length. One result has been a spike in anti-dam movements in Uttarakhand, including the one by the sadhus. 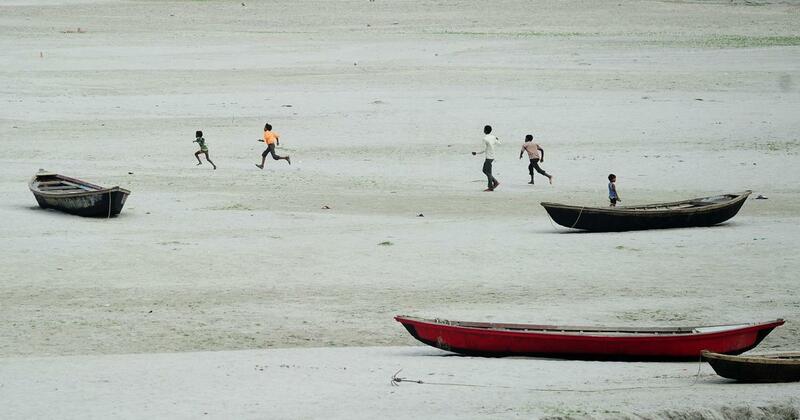 Maintaining that the Ganga is holy, they want it to flow without interruptions. In 2014, the BJP’s election manifesto took note of this and promised to ensure “the cleanliness, purity and uninterrupted flow of the Ganga on priority”. Shortly after the party won the 2014 election, it announced a Rs 20,000-crore project to revive the river. Namami Gange was intended to ensure nirmalta (purity) and aviralta (continuous flow) of the river. In Uttarakhand, ensuring aviralta was the priority. 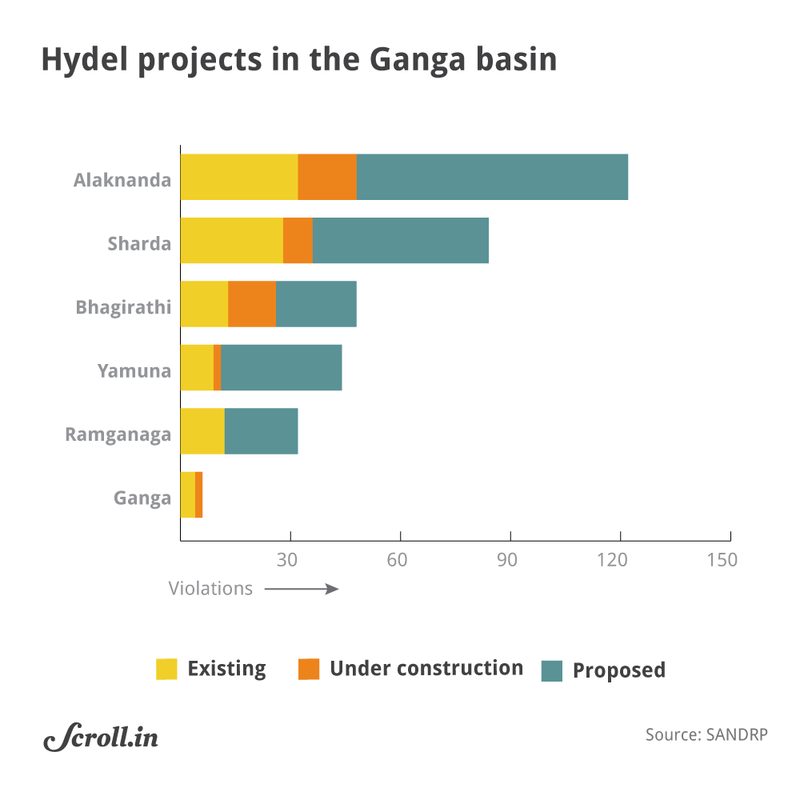 As the state’s rivers, which feed the Ganga, ran through tunnels for hydel power projects, both the rivers and the aquifers they recharged had dried up. Blasting to build dams and tunnels created new fissures into which mountain aquifers disappeared. Communities living by the river found local water sources drying up and had to walk longer distances to fetch their supplies. 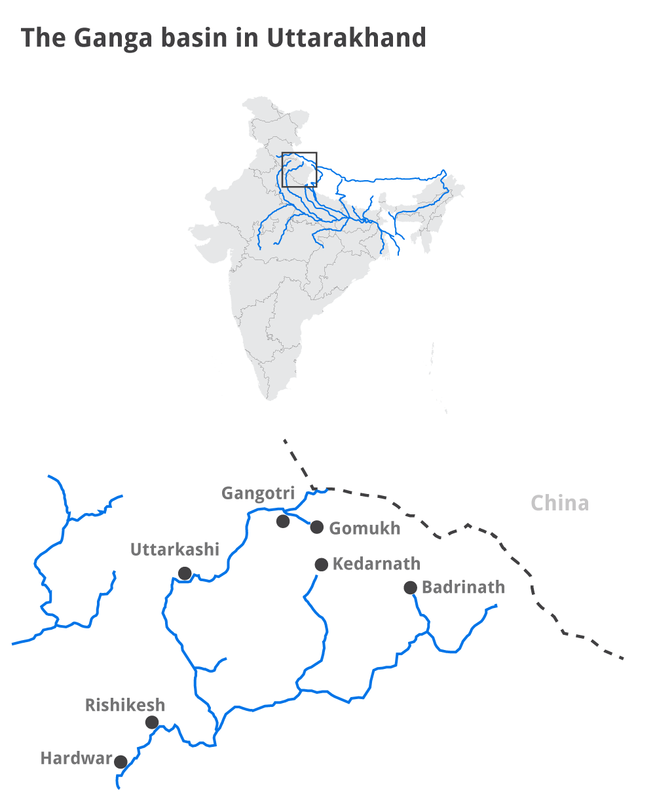 As dams fragmented rivers, fish such as the golden mahseer began dying out. In addition, the new hydroelectric power projects run the risk of cataclysm. The Himalayas see both earthquakes and cloudbursts, like the one in 2013 at Kedarnath which killed over 5,000 people and damaged 4,500 villages. After the cloudburst, several hydel projects failed to hold their surging reservoirs. As they gave way, downstream valleys saw walls of water bearing down on them. 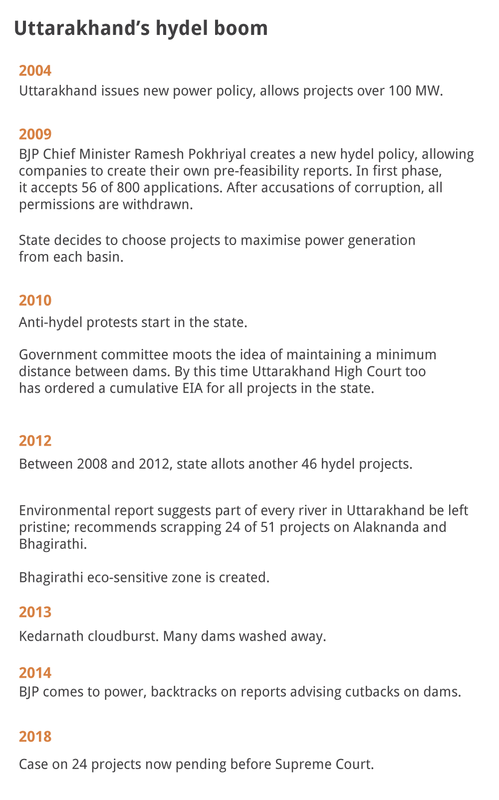 On November 1, 2010, heeding some of these concerns, the Congress-led United Progressive Alliance cancelled three hydel projects in Uttarakhand. It also declared a 100-km stretch of the Bhagirathi – from Gaumukh to Uttarkashi – an eco-sensitive zone. Two years later, environmental studies ordered by the Uttarakhand High Court proposed a minimum distance between hydel projects and suggested that each dam be required to release enough water for a river to perform its ecological functions. This is called “environmental flow”, or e-flow. One of these studies, by the Wildlife Institute of India, recommended that 24 proposed projects on the Alaknanda and the Bhagirathi be scrapped. The recommendations were subsequently endorsed by two committees. The first was set up by the National Ganga Basin River Authority in 2012. Headed by former Cabinet Secretary BK Chaturvedi, the committee, in its report submitted in April 2013, also recommended that six tributaries of the river be preserved in their pristine form. The second committee was set up by the environment ministry in October 2013 in the wake of a Supreme Court order regarding the Kedarnath cloudburst. It recommended that at least 23 of the projects flagged by the Wildlife Institute of India be dropped. By this time, in August 2013, after the cloudburst, the Supreme Court had banned new hydel power projects in the state. But after the BJP came to power in 2014, it rolled back several of these measures. Experts contend that the party’s decisions raise doubts about its commitment to reviving the Ganga. They also allege that construction projects are an opportunity for political parties to collect kickbacks. When the brakes were applied on hydel power construction, this system came under threat. Since then, successive Uttarakhand chief ministers, from both the Congress and the BJP, have put pressure on the Centre to keep the projects going. 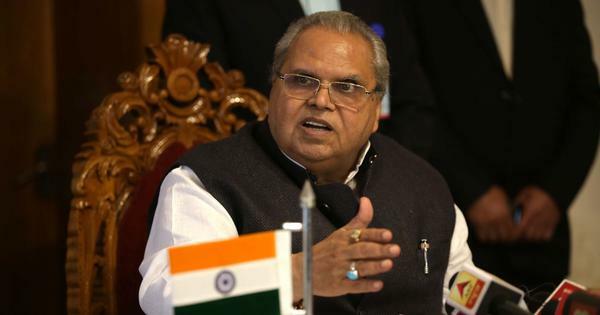 But the United Progressive Alliance government was better at resisting pressure from its state politicians than the BJP, said the former environment ministry official. Once the BJP came to power at the Centre in 2014, the number of hydel projects slated for review began to fall. Under Prakash Javadekar, the environment ministry first set up committees to examine the reports of previous committees. The ministry also reversed its position on hydel projects. In December 2014, officials in the ministry had submitted an aggressive affidavit to the Supreme Court. Contending that hydel projects in Uttarakhand had aggravated the devastation caused by the 2013 floods, it said the assessment of any project – part-complete or yet to start construction; cleared or not cleared – should consider the following factors: tectonic challenges of the area, safeguards during tunneling, disposal of muck produced during construction, impact of changing meteorology. It should also ensure 30%-50% e-flow during non-monsoon months. Tehri dam is an embankment dam on the Bhagirathi river in Uttarakhand. In January 2015, however, the ministry changed its position after a meeting chaired by a top official in the Prime Minister’s Office. It again started supporting hydel projects – even in the upper reaches of the Ganga which all reports recommended should remain untouched. In February, for instance, it submitted an affidavit to the Supreme Court stating a four-member panel it had set up found six of the dams flagged by the Wildlife Institute had obtained environmental and forest clearances in accordance with the rules and regulations. However, the panel, headed by Vinod Tare of the Indian Institute of Technology Kanpur, had warned against permitting these dams. The environment ministry selectively quoted from the report – only telling the court these six projects had all the clearances. Following a media outrage, the ministry decided in May 2015 to set up another committee under BP Das to evaluate these six projects. In October that year, the Das committee greenlit the six projects. That same month, on the insistence of the Uttarakhand government, Chief Justice of India Dipak Misra reduced the Supreme Court’s 2013 ban on all hydel projects, limiting it to the 24 projects flagged by the Wildlife Institute in its 2012 report. The ministry did not object. Instead, in January 2016, it told the Supreme Court it would allow any project releasing at least 1,000 cubic feet per second of water into the Ganga and its tributaries. In July 2016, this decision was challenged through a rival affidavit by the Ministry of Water Resources which insisted that all 24 projects be reviewed. The matter is pending before the Supreme Court. 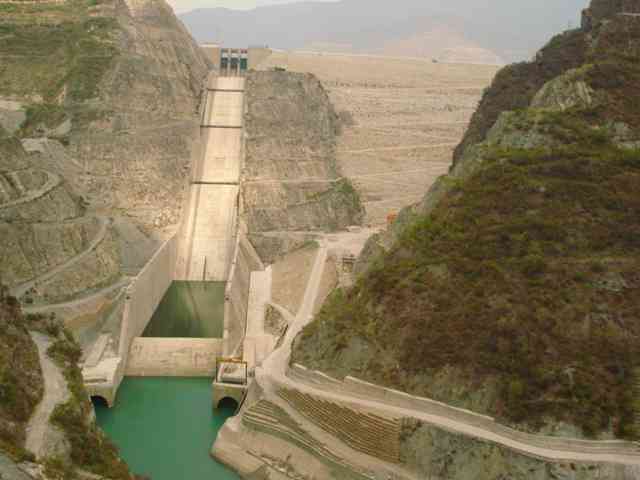 By 2014, a total of 450 hydel projects had been proposed in Uttarakhand. Few of these had been subjected to a rigorous cost-benefit analysis. The state had also not considered the environmental costs. It only wanted to maximise power generation, said a senior engineer at the Uttarakhand Jal Vidyut Nigam, the engineering utility tasked with hydel power generation. The Hydel Expert Appraisal Committee, the body under the Union environment ministry tasked with vetting hydel projects, had not taken a holistic view either. Headed by industry insiders, it has a track record of never rejecting hydel projects. The cumulative impact assessment ordered by the Uttarakhand High Court and the Supreme Court’s decision in 2013 to freeze all hydel power development provided the first real chance for the state to conduct a cost-benefit analysis of each of these projects. But what the country saw was a reduction in scope. In 2015, the Supreme Court allowed dams on all rivers except the Alaknanda and Bhagirathi. Instead of opposing the order, the environment ministry tried to reduce that number further down to 18. 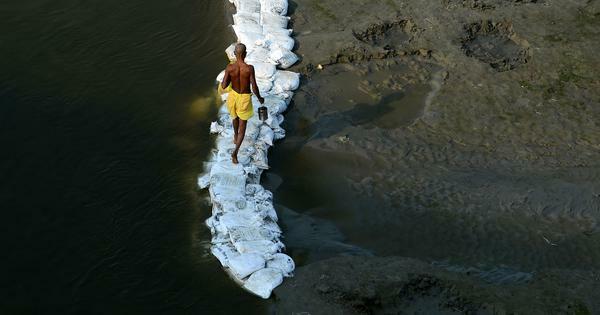 The government also backtracked on environmental flows even though, in their absence, the Ganga is not only unable to perform all its ecological functions, but is actually drying up even before it reaches Bihar. Its December 2014 affidavit to the Supreme Court had suggested 30%-50% environmental flows during non-monsoon months. 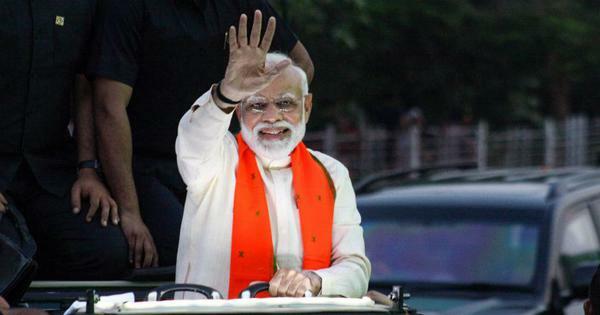 But on October 1, 2018, the government released new guidelines on e-flows which, for the Upper Ganga basin till Haridwar, mandated a minimum e-flow of 20% (of monthly average flow) between November and March, 25% in October, April and May, and 30% between June and September. According to activists, this would not be enough to meet local requirements. Expert committees, like the IIT Consortium and one set up by the World Wildlife Fund, said e-flows should be location-specific, pegged to local needs from the river. Both stipulations reduced water availability for hydel projects for power generation. Environmentalists say that numbers contained in the new guidelines are arbitrary. The government’s stipulations are lower than actual flows, indicating that it is under pressure to divert water for hydel power in the hills and irrigation in the plains. Apart from these measures, in 2016, the government decided to allow dams in the Bhagirathi eco-sensitive zone. Despite such enthusiasm, it is unclear if these hydel projects can be revived. That is partly because, between stipulations like e-flow and project delays, the projects are unviable now. “The cost of power from these projects will now be Rs 5-Rs 7 per unit,” said the Uttarakhand Jal Vidyut Nigam engineer. Solar, in contrast, is much cheaper. By July 2018, solar tariff bids had fallen as low as Rs 2.44 per unit. That is because India has not had much winter precipitation, he said. Base flows for Himalayan rivers come from aquifers, which in turn are fed by melting winter snow. As winter precipitation drops, these aquifers have thinned – and so have the rivers. Scroll.in sought a response from officials in the National Mission to Clean Ganga about this paradox, but they declined to comment. 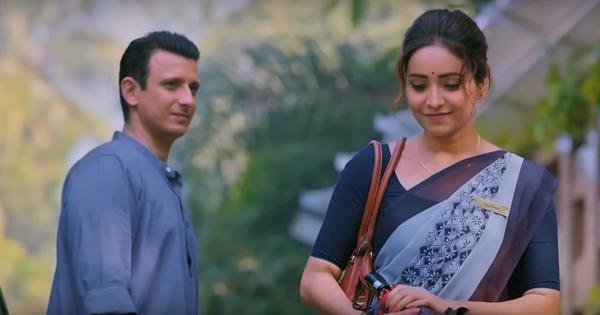 Attempts to meet Krishna Gopal, the Rashtriya Swayamsevak Sangh leader liaising between the organisation, the Bharatiya Janata Party and the anti-dam protesters were fruitless as well. Modi’s clean Ganga plan hinges on private companies tackling sewage. Will it work?